In this post, I explain that despite all odds a calendar is inadequate tool for scheduling todos. By the same token, through my argument, I take this opportunity to introduce you to the most unique feature of DayTickler. 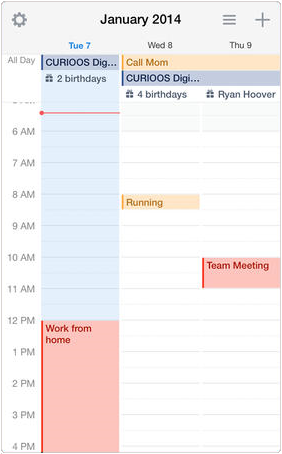 A calendar is a fantastic tool for scheduling events. It provides a very appropriate visual metaphor for time planning. This tool is appropriate because it is rare that we have to postpone an event. Events come and go; when their time come they perish like flowers. This is just the opposite with todos. Unlike events, more often than not, we are not able to complete a task on time. The accidents of life forces us to postpone the work later. Todos do not perish like flowers. They are rocks that clutter our way and that we must push ahead. Postponing a task is a very common scenario and unfortunately calendars do not forgive. Repeatedly we need to manually edit the start and end time. A cumbersome punishment that has no reason for being. We need a tool that will automatically move, as time progresses, uncompleted todos. This feature is one of the most important behavior of DayTickler, the personal task manager I am working on for several months. As I stated in a previous post, the most unique feature of our software is the ability to schedule a todo and the fact that, until it is completed, it moves as time progresses. Categories: DayTickler | Tags: calendar, schedule | Permalink.